If you follow this blog, you know that I recently discovered WorldFoods (from my mie goreng post) and am working with them on a couple of recipes. Previously, I posted a Cambodian Lemongrass Shrimp recipe. This is another recipe that I would like to share with you using another WorldFoods ready-made sauce—Thai Coconut Galangal Stir-Fry Sauce. This sauce is a blend of coconut milk spiced with galangal, lemongrass, tamarind and chilies. It’s mild but creamy so it’s great for any protein. When it comes to cooking, I am not a purist, meaning, I cook with store-bought sauces and spice paste quite a bit, but I am really picky. I use products that are high quality and promise great flavor. I really like this sauce because it tastes distinctively Thai, and it’s made from 100% natural ingredients. I also like it that I can doctor up the sauce by adding extra ingredients and seasonings. We all enjoyed this Thai Coconut Galangal Seafood very much, in fact, it tastes almost like a Thai red curry. Heat up the water in a small pot. Quickly blanch the seafood until they are half-cooked, about 1 minute. Drain and set aside. Heat up the oil in a wok over high heat. Stir-fry the onion and red chili, about 30 seconds. Add the seafood into the wok and do a few quick stirs. 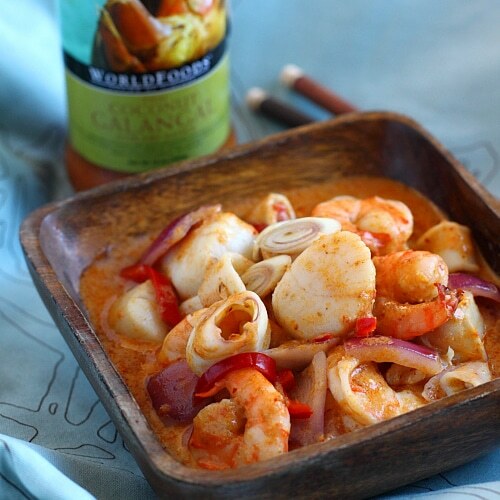 Pour in the WorldFoods Thai Coconut and Galangal Sauce. Add the chili garlic sauce, coconut cream, and fish sauce. Cook until the seafood is all cooked, dish out and serve immediately with steamed white rice. Ready-made sauce or not, this dish looks so good! Drooling. It must be very good with rice. I cant get fresh galangal anyways. So I opt for great store-bought sauces, so long the sodium content isn’t high. This looks so delish, I need to try this brand. Glad to know there’s someone Asian who’s also not a purist, hee, hee. We all have moments when we resort to using store bought sauces, esp. when you’re tired, bad tempered and hungry! I’ve not heard or noticed WorldFoods, wonder if it’s available in Miami at Whole Foods? We don’t have Trader Joe or good Asian supermarkets. Help, now I want it! I shouldn’t have looked at this before going to bed, Bee. I’m HUNGRY, my tummy is growling. Could you use Coconut milk if you can find coconut cream?? Thank you Rasa. I made this tonight and it was absolutley delish!!! The perfect amount of spice. Loved it and so did my husband. I made your Pad thai recipe the other night and loved it too. I am hooked and have shared your website with all my friends. Is there one recipe that is your favorite? I am looking foward to trying others. Thank you for your response! You are amazing:) This looks so delicious! Thank you, you are so sweet. Glad you like this recipe. You are tickling my taste buds for Thai food now esp for the cold weather now. Will try to find this bottled sauce. Thanks! With this phone, I am apble to be up to date with this site no matter where I have to work. No longer need to rush home to get onto my puter. Thank you for this site. I miss my Singapore food and has been pretty much “gasak buta” and “agak agak” he dishes. I am salivating over enjoying a bowl of this with a big heap of steaming hot rice. Just the ticket after all those rich dishes from last night at Thanksgiving. Happy holidays to you and your family! Galangal is a reason to use a pre-fab paste in many locations as Galangal can be pretty hard to find. While I can usually find it in my local specialty grocers, it’s not guaranteed to be available. Tempting and delicious with great recipe details. I should try to cook this one in next weekend. Spicy and delicious! Love this recipe. Not available here in Pennsylvania, and I’m dying to try this! Is there a homemade substitute?